Gold Basin meteorites were unwittingly discovered (and discarded) by gold prospectors in the "Gold Basin" area of the Arizona desert. Hunters looking for gold nuggets would find these "hot rocks" that would set off their metal detectors. Upon seeing this unremarkable rocks that obviously were not gold, they would toss them aside. Later, Professor Jim Kriegh (University of Arizona) recognized these rocks as meteorites and had them classified. He then spent many years mapping out the strewnfield of this ancient fall and his name is forever associated with this meteorite. 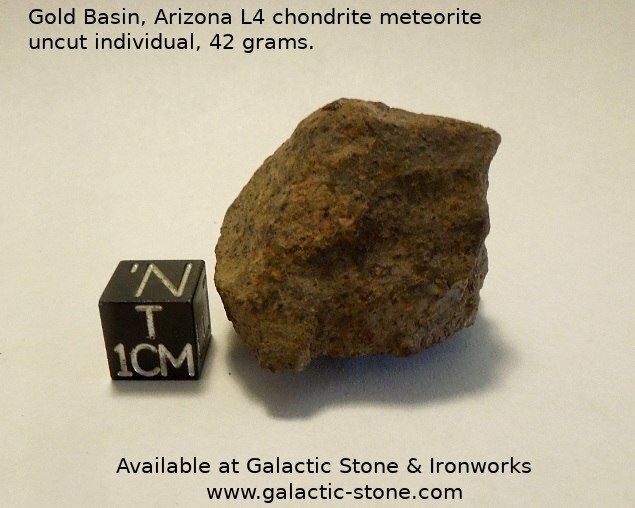 After analysis, it was revealed to be a L4 chondrite. The specimen available in the photo weighs 42 grams and is uncut. It would be ideal for cutting or jewelry making. It is also a fine hand specimen for educational or outreach use. It is a little smaller than a golf ball. Use coupon code "steemit" at checkout for 20% OFF your order. All Steemit members also get a bonus extra freebie with every order.